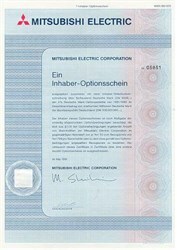 Beautiful engraved Certificate in nice condition from the Mitsubishi Electric dated 1991. This certificate has an ornate boarder with highly decorative background and an interesting counterfeit protection watermark. It also has the famous Mitsubishi Logo. This certificate looks terrific framed.